Always print preview your documents and make sure corrections are made before sending documents to the printer. When doing research, let the Lab Technician know, so she/he may print your documents on recycled paper. Do not use the printer as a copier. If you need multiple copies, please print one copy of your document in the lab and use the copier machine in the library for additional copies. When printing from the Internet, try to copy and paste the section you need to a document. Use a small font when possible. When printing presentations, please print the outline view or print six slides to a page. In order provide better service, we ask students to please report problems with the equipment to the Open Lab Technician immediately. Open Lab Technicians are the only persons who should service the computers and printers (including toner and paper replacement). Please see them for assistance. JagPrint facilitates the reduction of paper waste by allowing users to manage their printing more effectively, which helps to minimize a negative impact on the environment. The system allows users to see their environmental impact at-a-glance with the Paper-Less Alliance widget (a small application that sits on the desktop). JagPrint allows the College not only to effectively track and manage printing costs, but also proactively contribute to promote a green environment. 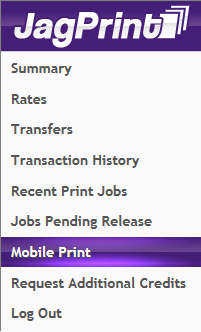 The Learning Commons and Open Labs has successfully implemented our newest printing service, Mobile Print. Users will now be able to print wirelessly through a variety of wireless devices (smartphones, laptops, and tablets) and obtain their printouts at any of our locations where a JagPrint station is available. You can also view this interactive tutorial to learn how to use Mobile Print. JagPrint uses print credits to track user printouts. One single-page printout uses .05 credits. For example, 1.00 credits = 20 printouts. Students, faculty, and staff will receive an initial allocation of 15.00 credits (300 single-page printouts) per semester. When a user logs into a lab computer, JagPrint displays the available credits for that account. Users can also view their available print credits from any on-campus computer. When students, faculty, and staff reach 2.50 available credits (50 single-page printouts), they may request additional printouts in increments of 75 by emailing jagprint@southtexascollege.edu from their South Texas College email account only. Requests from any other email will not be processed. Credits are generally refilled within 3 business days of the request submission. Learn how to request additional JagPrint printing credits by watching this interactive tutorial.